We make sure it’s one to be proud of. I worked with Jeff 6 months ago on a clients campaign. Jeff comes highly recommended as one of my go-to guys when I need to bring in the big guns. Jeff has been an asset to my company with the knowledge and techniques he brings to the marketing table. Jeff continues to surprise my team and me with his effectiveness in digital marketing. If you ever get the opportunity to work with him. Over the past few years I have known Jeffrey he has provided me with a number of insights into how to best leverage Digital Media to enhance the Trinity Auto Group, Mercedes-Benz Brand as well as my own personal brand. His post have been informative and pertinent. Jeffery is a constant sources of knowledge in how to build a reputable brand online through social media. He has lots of tricks and ideas. Very inspiring. Jeff is a very punctual, loyal and efficient managing director at Brand Vision. In a world where every second person seems to be a social media expert, Jeffrey is a rare veteran with years of hands-on experience managing social media, especially Facebook for local and national companies. I've worked with Jeffrey on a website launch and seen him in action on dozens of Facebook Marketing campaigns. Jeffrey has tremendous experience and insight in social media marketing, and I was super impressed with his knowledge of Facebook ad management in particular. Ideal for managing ongoing SMB Facebook marketing, events or launches. I am pleased to write this recommendation to Jeffrey Rufino. Mr. Rufino began our professional relationship in February of 2012. As the Member for Cairns, I have seen Mr. Rufino work studiously and with intelligence. He has established good relationships with his community, and during his time in Cairns he has developed strong leadership and interpersonal skills that have been unanimously praised by colleagues. Jeffrey is an action-oriented individual who gives his best to support regional businesses in elevating their brand. He often contributes to regional debates about brand web presence and SEO. I would recommend Brand Vision for strategic advice and implementation strategies for any business. Jeffrey is a very enthusiastic and passionate business operator who is knowledgeable about ICT and social media platforms. He implements strategies in these areas in businesses to improve their bottom line. Jeffrey has vision and exceptional marketing skills and a great knowledge of social media. He has assisted me on many occasions and would highly recommend his services. Owner, simply hampers...simply the best... gourmet gift hampers for inspired personal and corporate gift giving. For almost a decade, Jeffrey Rufino has dedicated his life to helping entrepreneurs from all walks of life achieve greater success through creating and building their personal brands online – starting with his own! Hailing from the Philippines, Jeffrey moved with his family to Australia while still a child in 1991. While his early memories are of extreme poverty, his parents inspired him with their determination to improve the circumstances of their family. This spirit has remained with Jeffrey in building his own successful career. Your online presence has a significant effect on your business success. That’s why you need to think of yourself as a brand when you’re marketing yourself online. You need to stand out on Google if you want to stay ahead of your competitors. This not only means appearing at the top of search results for your name; it also means keeping your online image positive and memorable enough to establish you as a trusted authority within your industry. Trust is what will attract customers and keep them coming back to you, time and time again. This is where we can help. Working closely with you every step of the way, we will devise a bespoke strategy tailored to meet your individual needs. As a result, you’ll have a standout online personal brand that will keep you far ahead of the competition. We manage and closely monitor the development of your personal brand, making sure all your online exposure remains positive. This frees you from the worry of negative press and it also establishes you as a true leader in thought and action within your field. We’ve helped entrepreneurs, business owners, CEOs, executives and academics from all walks of life. We are ready to do the same for you. You are a brand in your own right – we can help you become a truly successful one. We’re here for you at every stage, making the online world work in your favour. We will create a strategy that will grow your visibility and engage the right people to help you attain the business success you need. The process involves several steps which we will take on your behalf, as long as you give us the green light. Your online presence has a direct impact on all these things, which is why, guided by you, we will reinvent you as a brand which we can then promote strategically online to help you achieve your dreams. However you felt when you walked in, you’ll walk out a new, rebooted and more visible version of yourself, positioned for success. Now that we know who you are, it’s time everyone else did too. Using attractive, user-friendly web design and the very latest in SEO techniques, we will tell your story online in a way that reaches out to those looking for an expert in your industry. We will also spread the word on social media through creating highly optimised, professional profiles for you that present you in the best possible light, creating a complete online marketing strategy for you. Get ready to be the brand everyone wants to buy into! Digital marketing is a fast-paced world that’s constantly changing. Simply having an online presence is not enough. It needs careful management and nurturing in order to keep you as visible as possible and make sure you continue to stand out from the competition. This is why our team of experts stay up to date with all the very latest SEO techniques and algorithm changes on Google and all the major social networks. This enables us to capitalise on these developments to keep your personal brand at the forefront of people’s minds, making sure you are the first port of call for potential customers. Just as life is a process of constant reinvention, we will continually evaluate your personal brand online and update it to make sure you stay at the top of Google search results. Content marketing is the best way to establish you as a trusted expert in your field. Through sharing your knowledge and experience with others, you build trust and attract the attention of potential customers wanting to make informed purchase decisions. By creating and sharing the right content regularly on your behalf, we will keep your target audience highly engaged and establish you as an instantly recognisable, go-to authority in your industry. We will keep you updated regularly, letting you know exactly how our strategy is working for you and how your personal brand is continuing to grow. You own your name. We make sure it’s one to be proud of. Call us today to arrange a consultation and start building a powerful personal brand to shape a successful future. Jeff has as a vast array of knowledge on personal branding and social media but also has a sharp focus on ROI. Very experienced in digital marketing and always happy to give advice. Jeff has given me invaluable help and I highly recommend him. Although he excelled at design and IT in high school, Jeffrey initially worked in hospitality and retail. He felt unfulfilled and always kept his early interests on a backburner. When social media began to explode in popularity in 2007, Jeffrey instantly saw the possibilities of what it could do for people’s careers. Jeffrey became so active online, developing what he didn’t realise at the time was his “personal brand”, that he found himself at the top of Google search results. He began to be widely recognised throughout numerous business networks in Australia. As a result, he realised that if he could grow his own personal brand so successfully in this way, he wanted to do the same for others. Since then, he has built a strong reputation for himself as a brand developer for entrepreneurs from a wide range of industries. Jeffrey has also written a book about his experiences of helping people achieve their business goals through promoting their personal brands online. 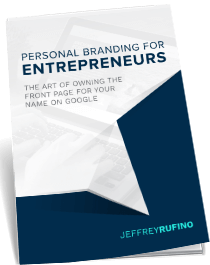 Order your copy of Personal Branding for Entrepreneurs: The Art of Owning the Front Page for Your Name on Google here on this website.